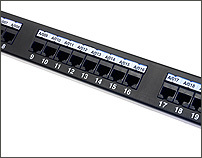 Our slide-in patch panel labels are made from heavy paper / light card and supplied on A4 sheets. Each label sheet is perforated for easy separation- no cutting required. Labels are printed using a standard office laser, inkjet and dot-matrix printer and our FREE Sharpmark Online Labelling Software.